272 pages | 94 B/W Illus. Multiple factor analysis (MFA) enables users to analyze tables of individuals and variables in which the variables are structured into quantitative, qualitative, or mixed groups. 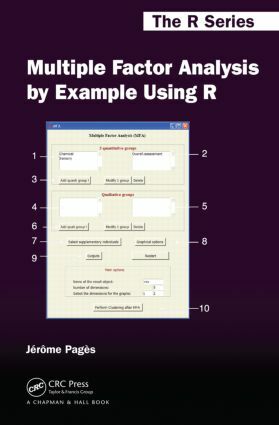 Written by the co-developer of this methodology, Multiple Factor Analysis by Example Using R brings together the theoretical and methodological aspects of MFA. It also includes examples of applications and details of how to implement MFA using an R package (FactoMineR). The first two chapters cover the basic factorial analysis methods of principal component analysis (PCA) and multiple correspondence analysis (MCA). The next chapter discusses factor analysis for mixed data (FAMD), a little-known method for simultaneously analyzing quantitative and qualitative variables without group distinction. Focusing on MFA, subsequent chapters examine the key points of MFA in the context of quantitative variables as well as qualitative and mixed data. The author also compares MFA and Procrustes analysis and presents a natural extension of MFA: hierarchical MFA (HMFA). The final chapter explores several elements of matrix calculation and metric spaces used in the book. Jérôme Pagès is a professor of statistics at Agrocampus (Rennes, France), where he heads the Laboratory of Applied Mathematics (LMA²).